Just couple days back, Google teased the launch of audiobooks on Play Store and it’s finally here. In a blog post titled, “Ok Google, read my book” the tech giant announced the launch of audiobooks on Play Store. Audiobooks on Google Play Store is rolling out in 45 countries and will be available in nine different languages. 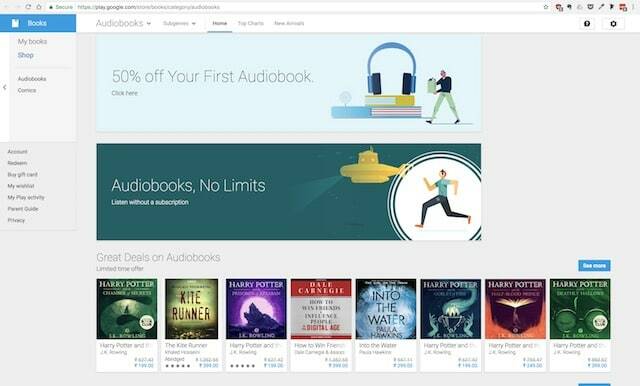 Here, Google is offering the same subscription-less audiobooks listening experience as Apple does on iTunes. Users don’t have to join any subscription account and they can just buy the books that they want. Google is also giving users to get the free preview of the book so that they can easily decide if they like the book or not before buying it. Users can also use the family library feature to share the books for free with their family members. Google has also integrated the audiobooks with its Google Assistant. So you can give commands like, “Ok Google, play my favorite book” and it will start playing. You can also ask Google Assistant to remind you of book’s details, like its author, publishing date, and more. Lastly, you can also set a play timer. Just say, “Hey Google, stop playing in 20 minutes” and it will stop playing the audiobook after 20 minutes. One of the best features of Google audiobooks is that your audiobook will be synced across multiple devices. You can start the morning by listening to the book on your Google Home, continue it on the road with your Android or iOS device with the Play Books app, and go to sleep while listening to it on your Google Home Mini. As you can see, Google might be late to the audiobooks game but it has launched itself on the scene with a bang. There are a ton of features that I love and it’s definitely worth giving it a try. Now, I am going to buy the Norse Mythology by Neil Gaiman. Do share with us which book is on your Radar.